I’ve been everywhere this summer, all over the country. Travel means eating in restaurants, cafes, diners, grocery store parking lots, airports, parks, and being surrounded by people while doing it. And, I’ve noticed a trend. Salads. People are eating a lot of salads. Which is awesome, greens are good. But so, so many of these salads are ordered with fat-free dressing or no salad dressing at all. 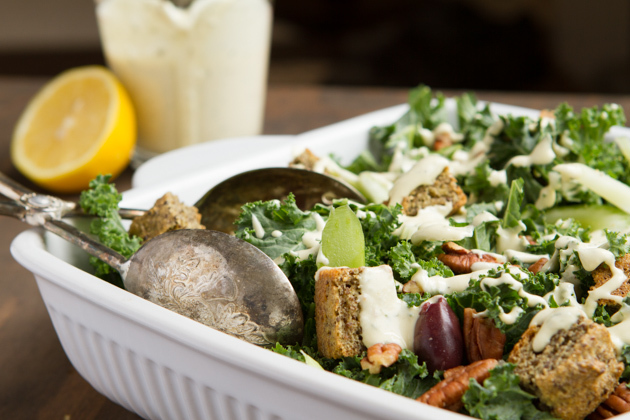 Greens need to be eaten with fat in order for our body to absorb + assimilate the nutrients. Here’s the deal:: There are water soluble vitamins and fat soluble vitamins. Just so happens that greens are mostly made up of fat soluble vitamins (A, D, E and K). 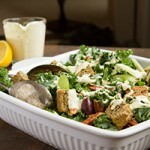 If we don’t add fat to our salads, the vitamins from the greens we’re eating cannot be properly used by our bodies. Simple as that. And that goes for green smoothies, too. Add some good, keto fats to that! When I started researching in preparation for this blog post, I Googled, “importance of adding fat to salad” and was provided with 7,080,000 results. Problem was, nearly every single link on the first 5 pages was about eating low-fat salads to maintain a healthy weight. We have it all wrong! Studies like this are popping up everywhere – science is proving that fats aren’t as evil as we once made them out to be. This is something that I’ve grown increasingly passionate about since finding nutritional ketosis. Our world needs change. What we’re doing (and eating) isn’t working. It’s so blatantly obvious that the low-fat, high-carb approach isn’t working for us. It’s time to give keto a chance. Fat doesn’t make us fat. 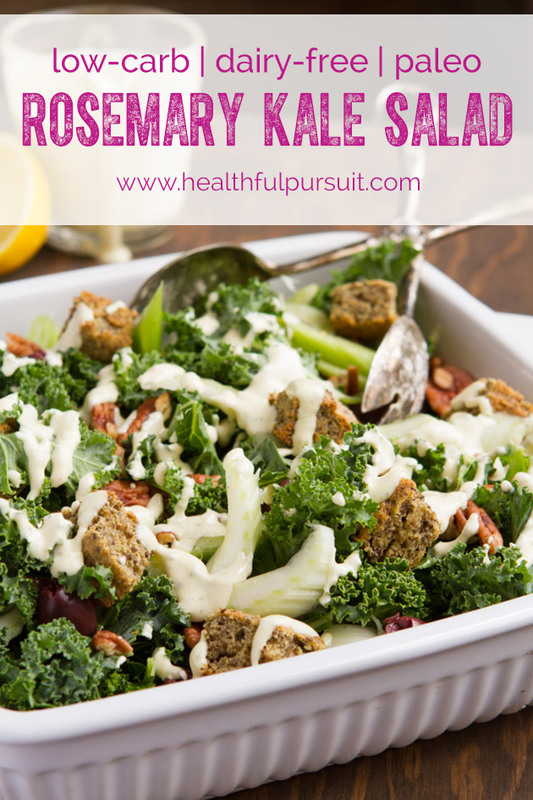 So today, I’m sharing a fat-filled, keto salad recipe with you. 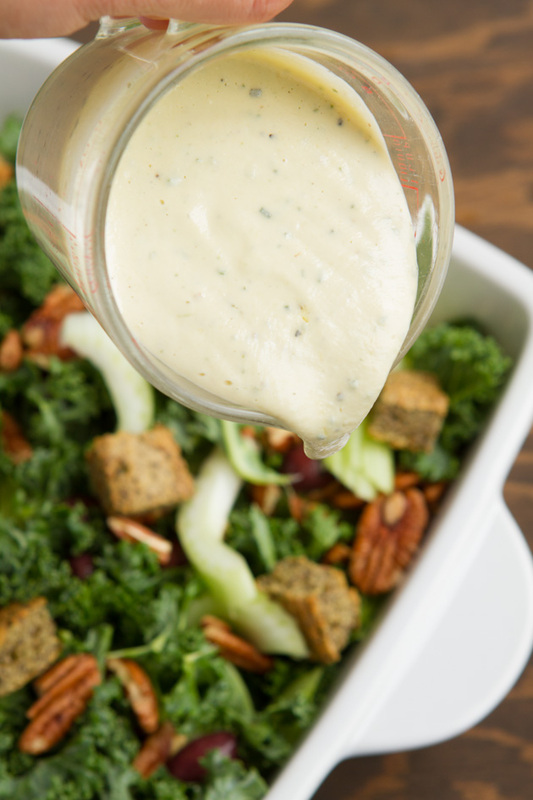 The fats in the creamy (dairy-free) keto salad dressing and keto pitted olives will assist in the absorption of all the nutrients you’re taking in, boosting your nutrient intake to new heights. 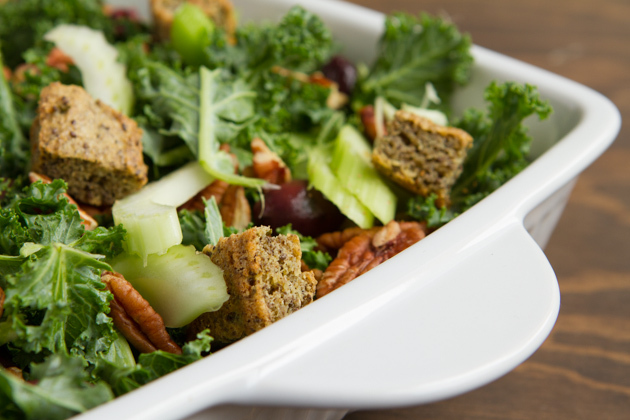 And the keto, grain-free chia croutons are out of this world! If you’re ready to create a new, keto life for yourself – liberated from food cravings, blood sugar irregularities, mind fog, excess body weight, cancer risks and infertility, this keto Q&A may be the next step in your evolution toward health and hotness. Get your 30-day guide to high-fat, keto living with a meal plan.